Available in a distinctive sleek 33cl can the stylish attractive packaging gives this product a high standout value. The use of the icon ‘a’ gives this cider a unique brand identity, its confident, attractive look communicates fruit and refreshment. 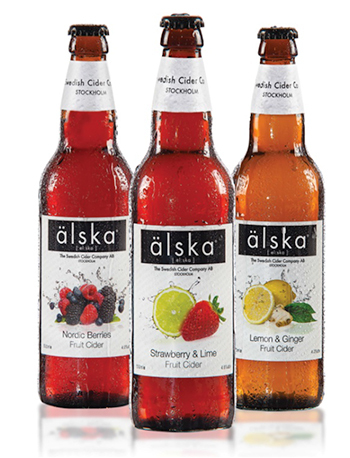 With a subtle, fruity and refreshing taste, alska is highly appealing to the female ‘millennial’ drinker; the product is subtly fruity, less sweet in an attractive premium package designed to be more travel friendly. The smell of fresh, juicy wild Nordic berries with the subtle undertones of pear combine wondrously in this semi-sweet cider to produce a slightly drier finish on the palate. Perfect chilled and poured straight onto ice. The distinctively tangy and tart flavour of lemons, combined with ginger produces a really refreshing drink for any occasion. Best served over ice with a wedge of fruit. The combination of zesty lime and strawberries is perfect when you are looking for a truly refreshing taste. With a subtle hint of sweetness, this is best served over ice with a sprig of mint. About World of Patria International World of Patria is a specialist, wine, beer, spirit and skincare distributor. It was founded in March 2006 by Rob Nicholas to target the expatriate fraternity living in Europe. This expanded to cover large sections of the travel retail and duty free markets shortly after its inception. provides them with a cost-effective and diverse portfolio enabling them to become leaders in their own market.